When we arrived at the hostel in Remla, we were amazed by and appreciative of everyone's kindness. It was such a relief compared to the other hostels we'd been to! We were given a key to our room, in addition to the key to the whole suite which was to be ours. The kind people who checked us in just wanted us to be comfortable and have plenty of space for our bicycles. We left to explore the surrounding area and hang out at the cafe for some free wi-fi. Later when we returned to the hostel, night had fallen and the place took on a whole different atmosphere. We met the night guard, who seemed to change the place into a prison. He came running up, looking for all the world like a Jedi in a long brown woolen hooded cloak, and began questioning us about our relationship. Were we married? Was there proof in writing?! No sharing rooms if youre not married! He also made us return the suite key (policy says that no guests can have suite keys, and that they all must be kept by the guard! Suite doors remain open at all times!) Later when we talked to the very friendly director, the situation was rectified. 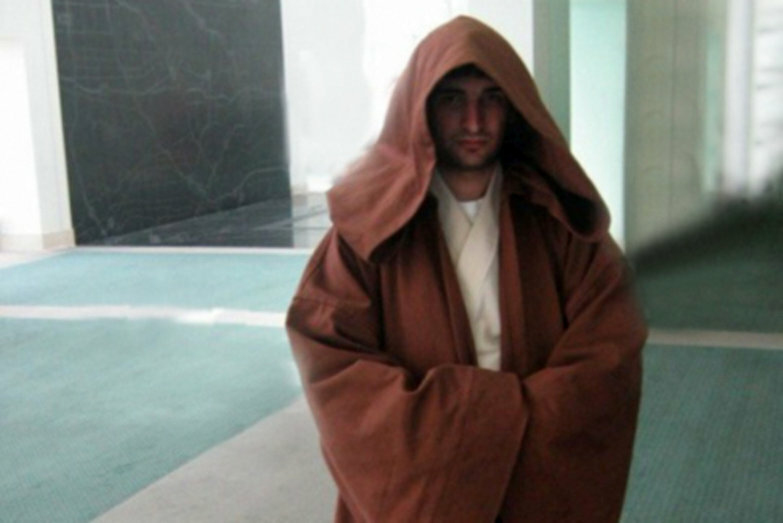 Many people in Tunisia wear long brown hooded capes, a traditional item of clothing that inspired some of George Lucas' costumes in Star Wars. Generally the cloaks seem fitting on the elderly and the country market folk that usually wear them, but the Gatekeeper of our former hostel wore one as well. The cloak, along with his general attitude and lack of people skills, made him seem like a geek way too into his fantasy role-playing character of a wizard or gatekeeper. I wouldnt be surprised if this guy was secretly carrying a sword. He was our nighttime nemesis, and we would often jokingly develop elaborate schemes to avoid him. Seeing as how we were the only people in the hostel, he seemed hell bent to be our keeper, when we just wanted to be left alone. He would close and lock the gate and if we wanted to leave we had to sneak out by climbing over a low wall. Sometimes he would lock us out, the only guests, even after being explicitly informed that we were leaving and would then need to re-enter the premises. If he wanted to notify us of something, he would come and bang on our door instead of knocking. Once when Tyler stayed late at the café and I returned to the hostel alone, he came beating on the door, saying that if my husband wasn't staying the night I was required to inform the administration immediately. I told him not to worry, he was indeed coming back shortly. The guard also came banging on the door one night to inform us that if we wanted to take a hot shower, we'd have to see him first! This man seemed to take his boss' word as law, and he was the enforcer. Though it was necessary to borrow a key for the shower block if we wanted to take one, he made it seem like a punishment. Tyler and I (but mostly Tyler) sometimes have issues with Authority, especially when those people in charge are deemed incompetent, nosy, and clingy. Everything came to a head last night when the Keeper came banging on our door at 11PM saying we had to move our bicycles and clear out of the public suite area, which we'd been living in for the last two weeks. The hostel was expecting a large group and those extra rooms would be needed. If it had been anyone else—any normal, friendly human being—we would have said "of course, that is completely understandable!" and been happy to accommodate the extra influx of people. As our nemesis delivered the news in his typical draconian fashion, Tyler cut him off and informed him we were leaving. After two weeks here, we're moving on to bigger and better things, namely our own hotel room with hot water. PS: That isn't actually our guy, but he doesn't look much different! hi guys! glad you are going to a hotel! take care and remember to HAVE FUN! ;) we love you and I know it can get stressful, but hang in there before you know it the wheel will come and you can ride 70 million more miles! Holy crap! It IS a Jedi!